Before you pick up your first birds, you need to prepare your chickens’ new home. The needs and requirements will vary depending on the type of birds, number of birds and age you are starting them. Chicks need one to two square feet of floor space per chick during their first 6 weeks of age. Ducklings, goslings and turkey poults will require more space due to their larger size. The normal brooding period for chicks begins when they hatch until they reach about 6 weeks of age. At this stage, warm, dry and draft-free environments are critical as the young birds develop adequate body size and condition to self-sustain themselves in various environmental conditions. The brooder, a house specifically made for starting chicks, will need to be warm and dry. For a very small number of chicks, a large sturdy cardboard box equipped with infrared heat lamps for warmth will suffice as a temporary home. A commercially made brooder may be available from your Purina dealer or you can find websites that sell brooders of various sizes and designs to start small to large numbers of chicks. 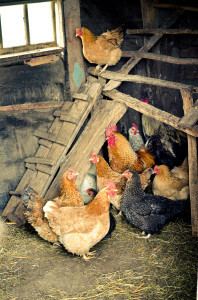 Brooders should be placed in an area that offers protection from the elements, is well-ventilated (but free from drafts), and is safe from predators. This could be a garage, a basement, shed or some other safe place. You will want to check on your chicks often so keep this in mind when deciding where to keep them. Commercial brooders should be thoroughly cleaned and disinfected several days prior to the arrival of your chicks to provide ample drying time. Place 3 to 5 inches of dry pine shavings (not cedar), straw or other absorbent litter (bedding) should be placed on the brooder floor. Paper towels can be used to cover the litter for the first several days to prevent chicks from mistaking the litter as food. Newspaper and flat cardboard can be slick and should not be used as it can cause leg problems (spraddle leg) in chicks. The heat source in the brooder or heat lamps should be adjusted to provide a 90°F temperature (at chick level) one day prior to arrival of the chicks. Turkeys require a higher brooder temperature of 100°F to start. A brooder guard ring (cardboard, plastic or wire barrier) should be placed around the brooding area for the first several days to keep the chicks close to the source of heat. If not used, the chicks may stray too far from the warmth and get chilled before they can find their way back to the heat source. The guard also prevents the chicks from crowding into corners and smothering, and provide enough space for chicks to move away from the heat if they get too warm. After a few days, the chicks will have learned where to find warmth and the guard can be removed. When using a cardboard box to start chicks, an infrared heat lamp placed about 20 inches above the surface of the litter will provide a good source of heat. It’s a good idea to use two lamps so that the chicks don’t get chilled if one lamp fails. Be very careful to position the lamp so it does not touch the box or any other object and create a fire hazard. The lamp height can be adjusted up or down to achieve the desired 90°F. Be sure to check this with a thermometer placed at the level of the chicks. Equip brooder with waterers and feeders. These are available in several different sizes and shapes to fit your particular needs. Having all the necessary equipment and supplies on hand before picking up your chicks will make the process much easier. After making all the necessary preparations, it’s time to place your chicks in their new home. The first few days of a chick’s life in your new environment are critical; supplying a little extra TLC will go a long way in giving them the best possible chance for a healthy future. Gently lift each chick out of their carrier and place them one at a time under the warm brooder. Dip the beaks of a few chicks into the water. This helps them find it sooner and the others will quickly catch on by watching. When starting turkeys, be extra watchful as they are not as quick to pick up on the mechanics of eating and drinking. During the first few days, use shallow pans, egg flats or squares of paper as temporary feeders. Small piles of feed placed on them will allow the chicks to find the feed easier and start eating earlier. On the second day, regular feeders can be introduced. Keep feeders full the first week. Feeding area should be big enough to allow all chicks to eat at the same time. As chicks become familiar with the feeders, the temporary feeders can be removed. Occasionally check your chick for signs of “pasting up”. Sometimes their droppings will stick to their rear ends and accumulate to where it blocks their vent and the poor chick can’t relieve itself. If you find your chick’s rear end is caked up, gently clean the vent area with a soft cloth and warm water. This problem usually dissipates after the first week. Provide chicks with 18 hours of light per day for the first week and at least 10 hours per day thereafter (natural light counts). Never let feed or feeders get wet. Wet feed is a breeding ground for disease and a recipe for disaster. Clean and refill waterers daily or more often if contaminated with feed or litter. Feeders should get a good cleaning weekly and more often if necessary. Keep feeders and waterers set to the height of the chicks’ backs as they grow to prevent them from defecating and kicking bedding into their food and water. Remove wet or caked litter as necessary and replace with clean, dry litter. Wet litter can result in chilled, sick chicks. Prevent your chicks from chilling or getting too hot. The best measure to determine if the temperature in the brooder is correct is how your chicks behave. If it’s right on target, the chicks will be evenly dispersed. Chicks that huddle together under the heat source are cold. Overheated chicks will station themselves around the edges of the box or brooder guard and may pant. The temperature should be increased or decreased accordingly by raising or lowering the lamps or adjusting the heat source. Use a thermometer. Disease can strike and spread rapidly between among chicks if they consume contaminated feed or water. Keep it clean and dry. Make sure feed and water stays free of litter and droppings. Spilled water should be cleaned up to prevent wet litter. Dampness in the brooder house will cause chilling and can lead to disease. Remember, feed and fresh, clean water need to be available 24/7. After about 18 weeks, it’s time to gradually introduce your laying pullets to Purina® Layena® Recipe feed or Purina® Layena® Plus Omega-3 Recipe feed to ensure that they receive the best nutrition to support egg production. Gradually transition your laying pullets over to Purina® Layena® Recipe feed over a 7 to 10 day period. Continue to provide birds with a maximum of 17 to 18 hours of light per day to ensure optimum egg production. Optimum egg production is achieved when layers are maintained in temperatures between 65°F and 85°F. As temperatures increase above this, egg production decreases and egg shell quality may suffer. Keep your birds cool and comfortable so you will get the best return on your investment. Stop by Standley Feed and Seed for all your chick supply needs. We have everything you need to raise a healthy flock. This entry was posted on Sunday, February 5th, 2017 at 9:10 pm	and is filed under News & Updates. You can follow any responses to this entry through the RSS 2.0 feed. Both comments and pings are currently closed.